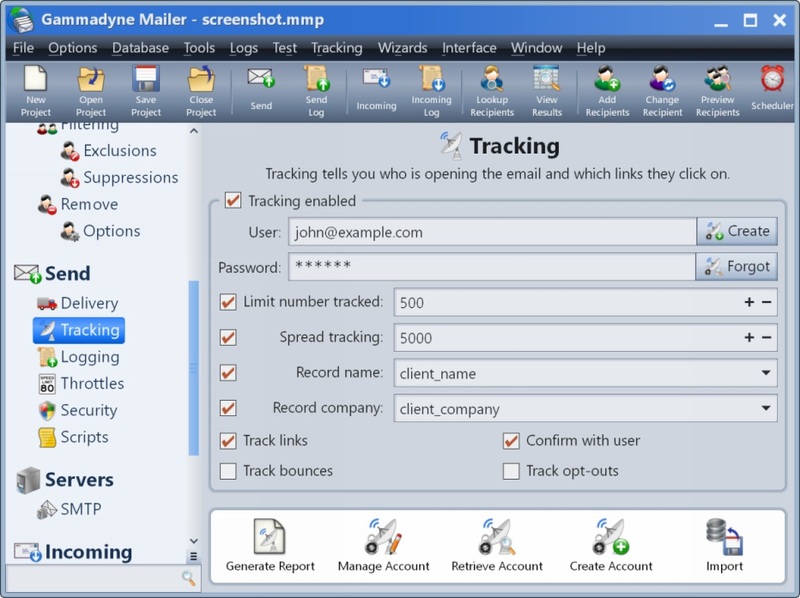 The Gammadyne Email Tracking System integrates with Gammadyne Mailer to report which recipients opened the email and which links they clicked on, among other things. This information can be invaluable for marketing and understanding your clientele. Compared to expensive email services like Constant Contact, you can save a fortune by relaying the emails through your own mail server. If you have a website, then it no doubt includes a mail server. Why pay an email service to use their server? The per-email cost of our tracking system is extremely thrifty by comparison. Focuses marketing resources on recipients who show the most interest or meet a certain criteria. Prevents waste of marketing resources on recipients who are in other countries, who speak a different language, or have the wrong operating system. A/B Testing. Compare two campaigns, side by side, to determine what design elements and content work the best. Link tracking allows you to identify what products/services a particular recipient might be interested in. Link totals allow you to gauge the overall demand for certain products/services. The clicks, view time, and number of reopens and forwards are used to calculate an "Interest Score" which indicates how enthusiastic a recipient is about the message. Low open rates may alert you to problems with the SMTP server, email content, spam filters, or blacklisting. Geo-location makes it easier to locate a phone number for a recipient. If you have purchased credits in the past, please use the same email address as before so that the credits are added to your existing account. If the email address is not in our database, a new tracking account is created. The free trial of Gammadyne Mailer does not support tracking. Please purchase a license first. Credits do not expire, and are not limited to one campaign or computer. There is no reason not to buy in bulk and save money. Interest score. This is a synthetic benchmark based on clicks, time viewed, opens, and forwards. On the tracking report, the recipients are sorted by highest interest score. Tracking data can also be exported to a CSV file. Click here to see an example. It is necessary to download and install Gammadyne Mailer, and purchase a license. After purchasing tracking credits (see above), the account password is emailed to you. Open your existing mailing project, or configure a new one as normal. Go to the Send/Tracking branch. Check the "Tracking Enabled" box. Enter your email address in the "User:" field. This must be the same email address that was specified when the tracking credits were purchased. Enter the account password in the "Password:" field. Enter the number of emails you wish to track in the "Limit Number Tracked:" field. This can be more or less than the size of the mailing list. You are only charged for emails that are actually sent and tracked, and you are not required to track them all. It may be necessary to disable any Internet security-related programs that are running on your system. Especially CA eTrust Anti-virus and any Trend Micro products. Their scanning of all HTTP traffic can be problematic. HTTP is used to notify our server that an email is being tracked. If this is a problem, you will know it when the tracking system reports a smaller number of tracked emails than Gammadyne Mailer reported. You can now send the mailing as normal (choose Send Messages from the Tools menu). Gammadyne Mailer will automatically insert the beacon into the HTML Body and modify the hyperlinks so that they can be tracked. Wait at least 5 minutes so that some of the emails will be opened. Choose "Generate Report" from the Tracking menu, or click the "Generate Report" button on the Tracking branch, or click the toolbar icon. Double click on the campaign that you wish to generate a report for. The "Tracking Report" window will appear. The report is one long HTML document, like this. The toolbar contains various tools for printing the report, saving it to a file, exporting the data to a CSV file, and more. All email tracking systems use the same method. A tiny image, called a beacon, is inserted into the message's HTML body. When the recipient's email client downloads the image, the tracking system recognizes this as an opened email. Please be aware that this is an imperfect method. Most email clients do not automatically download images. An open rate of less than 25% is typical, because many of the opens go unrecognized. We have priced the system taking this weakness into account. If the user clicks a link, our system will recognize that the email was opened even if the beacon was never downloaded. By seeing how many times this happened, the "Estimated Opens" statistic can be calculated. For a large mailing with lots of links clicked, this estimate can be very accurate. The Gammadyne Email Tracking System is not a hosted solution. Email is still relayed through your mail server as normal. Our system only intercepts the opens and clicks, and stores this information in a database waiting for you to retrieve the data through Gammadyne Mailer's interface. Tracking data is stored on our server for 30 days, then deleted. 99% of email is opened within 14 days of being sent. You will be given 4 days notice before a campaign is deleted. At that time, you should generate the final report and export the tracking data to a CSV file. If you like, we can automatically upload the final report to your FTP server. Choose "Manage Account" from the Tracking menu to configure this. Gammadyne Mailer includes a tool to import the tracking data into a database (choose "Import to Database" from the Tracking menu). The report does not include bounce-back statistics, because bounces arrive later at your SMTP server. Gammadyne Mailer is not privy to what comes in to your SMTP server unless you set up a Bounce-Back project, but even in this case there is no way to connect a bounce to a tracking campaign. You are strongly encouraged to keep bounces to a minimum by removing bounced email addresses from the mailing list after every campaign. Failing to do so is a common cause of blacklisting.